Coffey, A., and R.P. Ross. 2002. Bacteriophage-resistant systems in dairy starter strains: molecular analysis to application.Antonie van Leeuwen-hoek. 82:303-321. Fox, P.F., and PL.H. McSweeney. 2004. Cheese: an overview,p. 1 —18.In P.F.Fox,P.L.H.McSweeney, T.M. Cogan, and T.P. Guinee (ed.). Cheese: Chemistry, Physics and Microbiology, Third Edition, Volume 1: General Aspects. Elsevier Ltd., London. Guinee,T.P., and P.F. Fox, 2004. Salt in cheese: physical, chemical and biological aspects, p.205—259. In P.F. Fox, PL.H. McSweeney,T.M. Cogan, and T.P. Guinee (ed.). Cheese: Chemistry, Physics and Microbiology, Third Edition, Volume 1: General Aspects. Elsevier Ltd., London. Hutkins, R.W. 2001. Metabolism of starter cultures, p. 207—241. In E.H. Marth and J.L. Steele (ed. 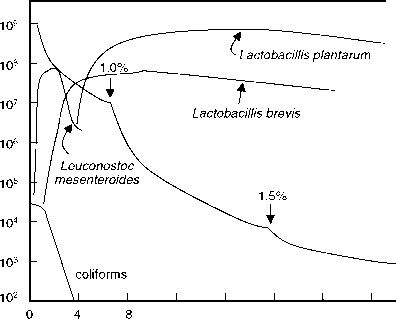 ), Applied Dairy Microbiology. Marcel Dekker, Inc., New York, NY. Kosikowski, F.V., and V.V. Mistry. 1997. Cheese and Fermented Milk Foods. Volume 1: origins and principles. 3rd ed. F.V Kosikowski, Great Falls, Virginia. Kosikowski, F.V., and V.V. Mistry. 1997. Cheese and Fermented Milk Foods. Volume 2: Procedures and analysis. 3rd ed. F.V. Kosikowski, Great Falls, Virginia. Lawrence, R.C.,J. Gilles, L.K. Creamer,V.L. Crow, H.A. Heap, C.G. Honoré, K.A. Lawrence, and PK. Samal. 2004. Cheddar cheese and related dry-salted cheese varieties, p. 71-102. In P.F. Fox, P.L.H. McSweeney, T.M. Cogan, and T.P. Guinee (ed.). Cheese: Chemistry, Physics and Microbiology, Third Edition, Volume 2: General Aspects. Elsevier Ltd., London. Lucey, J.A., M.E. Johnson, and D.S. Horne. 2003. Perspectives on the basis of the rheology and texture properties of cheese. J. Dairy Sci. 86: 2725-2743. Marcos, A., M. Alcala, F. Leon, J. Fernandez-Salguero, and M.A. Estaban. 1981.Water activity and chemical composition of cheese. J. Dairy Sci. 64: 622-626. McSweeney, PL.H. 2004. Biochemistry of cheese ripening. Int. J. Dairy Technol. 57:127-144. McSweeney, PL.H. 2004. Biochemistry of cheese ripening: Introduction and Overview, 347—360. In P.F. Fox, PL.H. McSweeney,T.M. Cogan, and T.P. Guinee (ed.). Cheese: Chemistry, Physics and Microbiology, Third Edition, Volume 1: General Aspects. Elsevier Ltd., London. Pintado, M.E., A.C. Macedo, and F.X. Malcata. 2001. Review: technology, chemistry and microbiology of whey cheeses. Food Sci.Tech. Int. 7:105-116. Singh,T.K., M.A. Drake, and K.R. Cadwallader. 2003. Flavor of cheese: a chemical and sensory perspective. Comp. Rev. Food Sci. Food Safety. 2: 139-162.